A picture of the full "Russkaja" group. Filed under Arts & Entertainment, Columns, Featured A&E, Music, Scote's G.O.A.T.S. Ever think to yourself: “Gee, I wish I was invited to Joseph Stalin’s beach party?” Besides the fact that Stalin has been dead for a long time, he did not throw beach parties. Trust me, I looked it up. Not to mention if he did, it would probably be catered by gulag prisoners, and that would be awkward. Finding the right band, however, wouldn’t be hard at all. 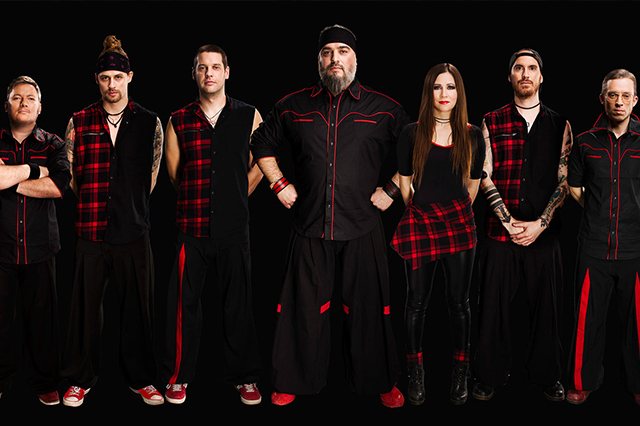 Russkaja is a musical group from Vienna, Austria that combines musical elements of heavy metal, polka, ska, and a taste of the motherland to create their unique sound. Creating a strange and beautiful mix of sounds, the unique sound of “Russian Turbo Polka Metal” makes the band’s covers and original content a memorable experience for its listeners.Today, we will be discussing their songs “Ras, Dwa, Tri” and “Da Mama” off their 2010 album “Russian Voodoo”. “Ras Dwa Tri” is the first song on their album, and it absolutely shreds. Ras, Dwa, Tri, which translates from Russian to One, Two, Three, would make you think that the song is about learning Russian numbers or that it would be some kind of waltz, right? Wrong. Thanks to the amazing powers of Google Translate, I can tell you that the song is about lighting anyone and everyone on fire! Don’t believe me? The few times in the song when lead singer Georgij Makazaria sings in English he either says “Set on fire!”, “Jump on fire!” or “Light on fire!” It’s about what you would expect from a Russian ska band. Otherwise, the song is worth a listen, even though I wouldn’t call it my favorite. “Da Mama” is a lot like a mosh pit at Oktoberfest. You have no idea what is going on, someone is screaming into a microphone and you feel indecent when you are not wearing lederhosen. An absolute assault on the eardrums, “Da Mama” combines fast moving saxophone riffs, angry Russian screaming and the aesthetic of a viking’s workout playlist into a package that is a treat to listen to. Right from the start, the song opens with an impressive saxophone riff. It then quickly turns into a peanut-butter-and-mayo combination of deep Russian man screaming and an even deeper-depressed Russian man chanting. The composition combines the epic intensity of heavy metal while staying true to the silliness of Romanian-style polka. The song sounds as if System of a Down collaborated with “Weird Al” Yankovic to help a depressed Russian man-child let out anger because his mother wouldn’t let him play with his friends. The song follows this formula of angry screaming, depressed chanting, blaring saxophones and hilariously epic build-up until its abrupt ending. The song ends with an homage to Queen’s “Bohemian Rhapsody,” but instead of pleading to his mama for forgiveness, Makazaria screams to his mama as if he wishes an eternal damnation upon her. “Da Mama” is definitely one of, if not, my favorite song by Russkaja. I would highly recommend listening to this musical masterpiece if you have not already.